The Washington Post reported this week that the CIA is seeking to expand its use of drone strikes in Yemen. According to the report, the CIA is currently “limited” within Yemen to using drone strikes against known individuals on a targeted kill list. However it now is seeking permission from the National Security Council (Chaired by President Obama) to launch drone strikes when intelligence shows what is called the “telltale signature of al-Qaeda activity”. These so-called ‘signature’ strikes (as opposed to ‘personality’ strikes) are based on intelligence about vehicle movements, communications, movements in and out of a particular building or compound, and patterns of behavior. It should be noted that in Yemen, as opposed to Pakistan, US military forces such as the Joint Special Operations Command (JSOC) are also involved in launching attacks against suspected al Qaeda targets and these forces may well already have such “permission”. Of course the whole idea that the US can grant itself “permission” and “authority” to attack either known individuals associated with al Qaeda or those suspected of being involved, anywhere in the world, at any time has no basis in international law as many have repeated made clear. HRW argues that command of all US armed drone strikes should be transferred to US military forces rather than remain in the hands of the secretive and unaccountable CIA. Others argue that the drone strikes should cease altogether and accuse the US of participating in war crimes. Drone protestors attempted to deliver a war crimes indictment at Hancock Air Force base this weekend on Earth Day were preemptively arrested by police two blocks from the entrance. According to the groups press release, those arrested included an 87 year old woman in a wheelchair, parents (accompanying their children), a member of the press, and the group’s attorney Ron Van Norstrand. Cameras, camcorders and phones were confiscated by the Sheriff’s Department. Six other people, did manage to reach the gate of the base, where they were also arrested. The indictment can be read here. Meanwhile General Atomics, maker of the Reaper and Predator, have announced they have designed a significant upgrade for their drones which will enable them to expand to almost double the amount of time they can stay in the air. The company is proposing extending the wings, adding additional fuel pods and strengthening the landing gear in order to enable the drone to stay aloft for up to 42 hours nonstop. 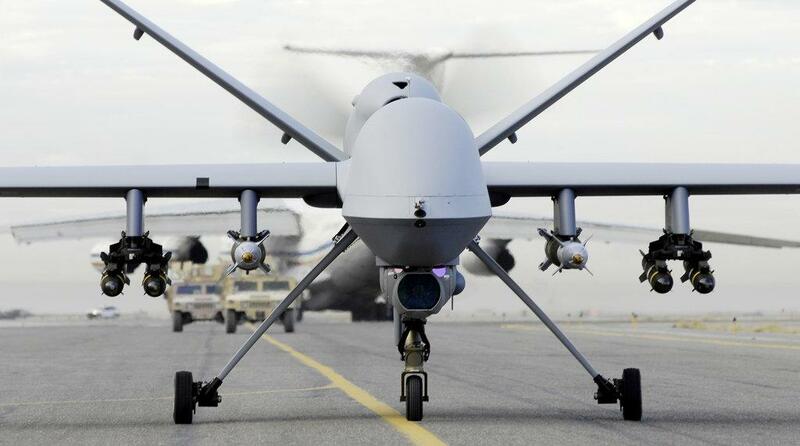 General Atomics says the upgrades can be done to current drone in service ‘in the field’, but as yet it is not known if this proposal will be taken up by US and British military who have armed drones in active military service.